Ski Denton offers all kinds of downhill skiing. Located on Route 6, the skiing ranges from beginner slopes to the Avalanche Trail, and a Black Diamond rated trail that is one of the most dangerous, vertical drop ski experiences on the East Coast. There are ski lifts at the park, each of which stops at a different elevation on the slopes. Lift-access Snow Tubing is also available. Ski Denton receives a lot of natural snow each year. 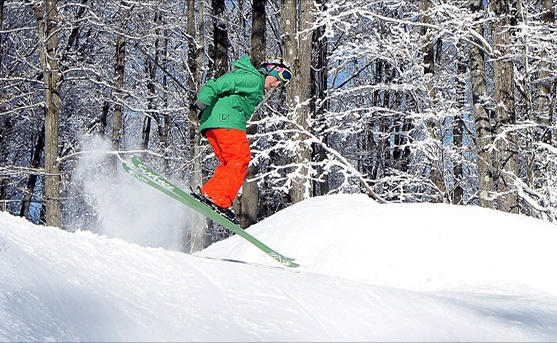 Usually over 100 inches annually, which helps draw skiers to its remote location in north central Pennsylvania. Ski Denton opens its slopes and trails for lift-serviced mountain bikers in the off-season. There are over 50 miles of maintained downhill and cross-country single track trails available for riding. Mountain bike trails begin at Denton Hill State Park and is 15 miles long, passing through Patterson State Park on its way to Cherry Springs State Park. Part of the Susquehanna Trail system, an 85 mile loop hiking trail, forms the southern border of the park. Scenic lift rides are offered any time during the posted operating schedule and provide the rider with beautiful panoramic views of the country.